After studying throughout the winter break, I finally took the Network+ exam and passed! I had to study for a few hours each day, watching Network+ CBTnuggets videos, which I might add were excellent! I also prepared the three days prior to taking the exam by taking the practice tests on Testout. These two combined got me ready to take the exam, which is 100 questions that you are given 90 minutes to take. You have to score a 720 to pass which by my calculations There's quite a bit of network troubleshooting, wireless standards, and protocols. 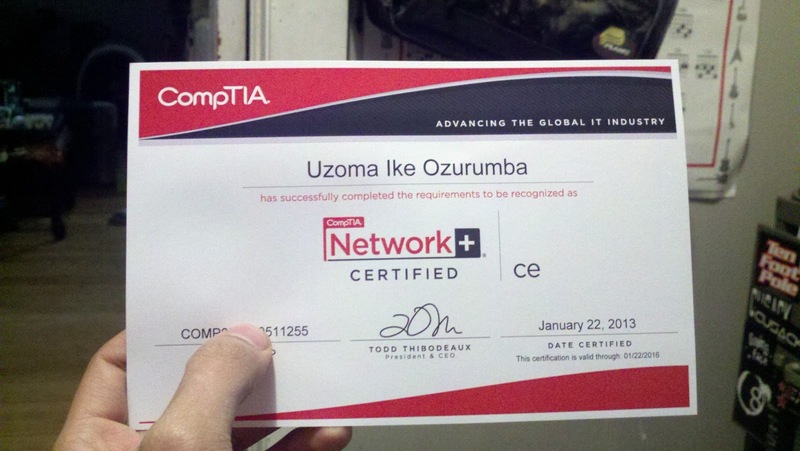 Really the exam is pretty well rounded so it pays to learn every area of networking, from concepts to security. It pays to know your acronyms though, as the test will relentlessly use them. Looking back on things I would say after all the online videos, using the practice tests to gauge preparedness was key. Also one thing that really helped was using flash cards (i used the digital version Studydroid) to help memorize the Well Known Ports of various protocols. I was going over these the night before and even while I waited to take the exam! I find ports a hard thing to keep memorized since they don't have any logical association to their names.So just flashing them over and over right before the test is an easy to way to make sure you can recall them when the questions arrive. This at least let me know that I wasn't going to bomb the test. There's not much else to say. I definitely over prepared for the test. I learned way more than they asked in the 100 question exam, which I think is great. I I am glad I was able to get certified on the first try. School starts up again tomorrow so we are right back to the grind! To prepare to its examination There are resources towards the PMI website. they\'re the capm credential book, sample inquiries IN ADDITION TO You can do a good mock-up of any examination called the PMI fundamentals CAPM examination.